The people of Shengal, dozens of its organisations and associations have reinvented themselves anew after the fatal genocide of the 3rd August 2014. Following the 73rd genocide on the 3rd of August 2014 in which thousands of Êzidîs were massacred and thousands of girls and women taken as slaves, the Êzidî community has formed its very own military forces, councils, educational organisations, academies and political parties to protect their community from being subjected to any new massacre. Let's take a look at the associations and organisations, which have been founded in Shengal following the genocide. After the people managed to escape to the Mount Shengal, which was always a safe haven the Êzidî community fled to during each and every previous genocide they faced, it opened also this time its stiff arms for its people. Nine riders defended the most strategic spots and hindered the ISIS gangs to even set a foot on the mountain. Hearing this, armed and unarmed Êzidîs hooked up with the troopers to fulfil once more their historic duty, plunging themselves into the emplacements and the path of resistance. Those very same ones who teamed up with the life-saving troopers, decided that time had come for them to establish their own defence force, comprising of young Êzidî men and women. In September 2014, not even one month after the brutal genocide, they finally declared the formation of the Shengal Defence Units (YBŞ). The Êzidî youth, whose hopes with outside forces had been totally severed, flocked one by one to the ranks of the YBŞ. When the YBŞ was founded, it stressed that they are the reaction to the genocide and that they will stop with their bodies as shield the fate of being subjected to ever recurring genocides. What is the reason behind the formation of the YBŞ? Even though thousands of armed soldiers had been on the spot, within a couple of hours the Êzidî community had been abandoned and left to fend for themselves as the entire population of Shengal had been thrown at the ISIS gangs' feet. The Êzidî community, which served for years in the armies of the Kurdistan Democratic Party (KDP) presided by Masoud Barzani and of the Iraqi state, found themselves all of a sudden totally alone with no one being ready to protect them and standing for Shengal's honour. Unforgettable are the moments when Barzani claimed in a statement some days before the genocide Shengal to be his honour, but throwing that honour in one single night under the bus without giving even one note alone and without looking for a second behind. For this simple reason the founding of the YBŞ was a must. So that the youths of the holy Ezidkhan is able to defend its people and homeland on their own and to not get stuck into the trap of betrayal once more, the decision to found the YBŞ was taken. Those who were killed and abducted the most during the genocide were once again the Êzidî women. Alone to not fall into the hands of the barbaric ISIS gangs and to remain faithful to their ancient religion of the peacock angel Tawusê Melek, hundreds of women jumped from the high cliffs of the Mount Shengal with a straight face. The other Êzidî women were taken hostage and sold in markets in this 21st century, which boasts with having improved on humanity and democracy. Because the systems the Êzidî women were living in rendered them without will and confidence, the arrival of the seven troopers among whom were also female combatants fighting fearlessly against the ISIS gangs in their emplacements, filled their hearts with enormous hope. When shortly afterwards fighters of the Women's Defence Units (YPJ) charged the ISIS gangs relentlessly to save the people and open the life saving Corridor of Humanity, the Êzidî women began to convince themselves that also they can like these brave women take position in the emplacements of the resistance. Borne out of all this, Êzidî women decided in 2015 to establish the Women's Defense Unit of Shengal (YPJ-Shengal). Shortly after that the name got changed to Shengal Women's Units (YJŞ). The YJŞ said in its first statement that they have decided to forge this military formation primarily in order to avenge the Êzidî women taken slaves and sold in markets. 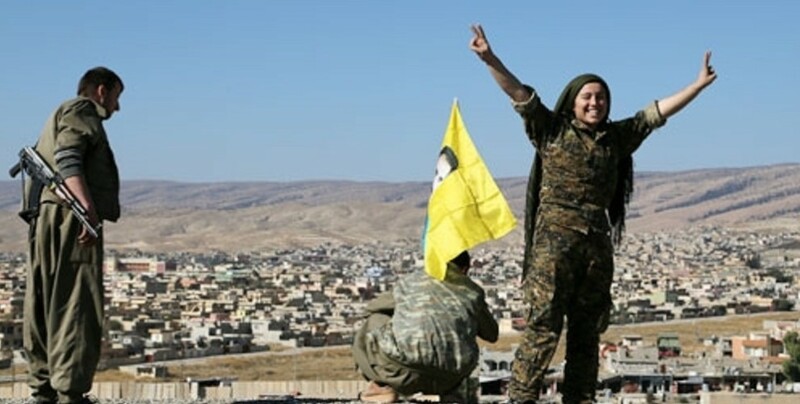 Until now the YBŞ and YJŞ have liberated the city of Shengal, the town Khanasor, the villages of Dohula, Boruk, Digur, Bare, Kerse, Çilmêran, Behreva, Medîban, Kolik, Xeyalê, Sikêniyê, Cîdalê, the entire Mount Shengal and the way connecting Shengal with Raqqa. Even though there might be now a couple of different units present in some areas and villages, those villages and towns however have all been liberated from ISIS gangs with the blood and sweat of the YBŞ-YJŞ. A border of 39 kilometres separated the emplacements of the YBŞ-YJŞ from those of the ISIS gangs. Until the arrival of the Iraqi Hashd al-Shaabi unit to these areas, the People's Defense Forces (HPG) and the YBŞ had already fought shoulder to shoulder for 11 months against the ISIS gangs in Shengal. The Êzidî community decided on the 14th January 2015 for the first time in their history to administer themselves without being dependent on anyone else anymore. The main objective of the Assembly is to organize, protect and educate the people. When these aims were issued in the press, Barzani was the first one to voice his discontent. He openly stated: "The PKK wants to establish cantons in Shengal." But this was on the contrary a decision given by the people of Shengal themselves. The people saw after the genocide that if they do not administer themselves in such a decisive time, facing genocides will always be their fate. To prevent new massacres against their community, they established the Shengal Constituent Assembly. This Assembly does exist for two years now and representatives of all organisations and associations are part of it. The Assembly consists of 14 committees and has altogether 34 members. In July 2016 the Council of Khanasor was also declared. Following the flood of returnees to their villages, the Êzidî Democratic Society Coordination made the decision to have every village form its own council. On the 11th March 2017 the village Borik founded its council, and on the 30th of March the Council of Serdeşt at the Shengal mountain, comprising 63 members, was introduced. On the 14th January 2017, the anniversary of the Shengal Constituent Assembly's foundation, efforts towards the realization of Shengal's autonomy were launched. As many civilians started to return to all villages in Shengal with thousands of Êzidîs still remaining in Mount Shengal, the reinforcement of the council became a must. On the 30th of May the Constituent Assembly held its 2nd congress, in which among other things the name of the council was changed to Shengal Democratic Autonomous Assembly. Members of this assembly are representatives of all existing villages, comprising of altogether 101 persons. In addition to that, the system of the Co-presidency was also introduced, something unprecedented in the history of Shengal. Following the assembly's proclamation, the Shengal Executive Board was elected as well. All organisations and associations of Shengal are part of the Shengal Democratic Autonomous Assembly. The biggest victims of the 73rd genocide were once again women and girls, who were humiliated and sold as slaves at markets. Êzidî women who were determined to build up their own strong will and administer from now on themselves, decided to institute the Free Êzidî Women's Movement (TAJÊ), whose primary role and mission is to organize and educate Êzidî women. The council of the TAJÊ consists of 31 members. After the brutal genocide academies and education per se became an eminent necessity particularly for the Êzidî community. For that reason the Academy of Martyr Egid Efrîn was established in January 2016. This academy provides many lessons and courses periodically, mainly on the subjects of the core of the Êzidî belief, the Êzidî religion, Êzidî culture, self administration and becoming bearer of one's own will. Also leading figures of the community take part in these lessons, which extend over a period of one month. Another academy is the Independent Academy of Martyr Binevş Edessa, founded by the Free Êzidî Women's Movement (TAJÊ). On top of that, also military training in the frame of self defence is offered. As there is nothing left anymore upholding the names of the regional government and the Iraqi system in Shengal, the Êzidî youths have opened in pitched tents provisional schools for the children of Shengal according to their limited possibilities. Classes are being given under such conditions for three years now. And for the first time ever Shengal's children enjoy lessons in their mother tongue. In every village and every area schools have been set up and children are educated. All in all ten schools have been built up so far, consisting of 40 classes. The educational level goes up until the sixth grade. While last year 400 pupils enrolled in classes, this year the number of the students has grown up to 600. Altogether 33 teachers are in charge of the schools. Language, Mathematics, Social Studies, Sport, Art, Biology and Music lessons are available. This year also Arabic and English lessons have been added. The Social Service Office was introduced following the genocide. Its priorities are to place its service at the Êzidî community's disposal and meet the community's needs. It is indiscriminately at the service of all the entire people of Shengal. With five water tanks, one tractor and one garbage truck, it tries hard to secure service for 55 to 60 thousand people. 47 volunteers are working unfailingly for this office. The Êzidî Freedom and Democracy Party was founded in 2016, joined by the Movement of Free Êzidîs. Its chairman is Sheikh Qehtan Eli. The main aim of the PADÊ is to organize the people, enlighten and educate them. The PADÊ will take part in Iraq's general elections and represent Shengal's Êzidî community. There are three main offices of the PADÊ in Shengal's villages. The party has been acknowledged officially by the Iraqi state and issued its licence. As the population in Shengal's centre and villages is ever growing again and also because the YBŞ and YJŞ units are mostly active on the frontlines, the unanimous decision was given in June 2016 to introduce an own separate police force, the Asayish, for the protection and maintaining of the internal security. With this purpose the police force of Ezidxan was established. Hundreds of its policemen and women are protecting and keeping safe the villages and central areas against any attacks from outside. To provide the YBŞ and YJŞ with professional training, the Êzidxan Special Units (YTE) was founded in 2016. It is a special task force taking care of more dangerous situations, which has already rescued dozens of Êzidî women from the clutches of the ISIS gangs in special operations so far.